On with the card reviews of Knights of the Frozen Throne! Today we're going to look at a few class cards that have been released to date. Keeping to a vague theme, we're going to look at classes with a connection to nature: Druid, Hunter, and Shaman. Each card is going to be rated for Constructed play in both Standard and Wild formats (meaning it will get two ratings if applicable). Ideally, I'm going to rate a card on how viable I believe it will be in each format, and also how fun it is to play. Millhouse Manastorm - Like its namesake, this is a card that can lose you the game outright when you play it. The druid has, as of this writing, four cards released, including its class legendary. 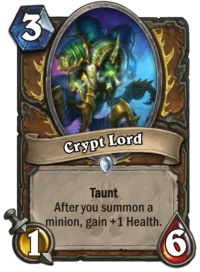 The Crypt Lord is a low-cost Taunt minion with decent stats for its Mana cost (1/6 for 3), and a solid ability if you're running a board-flooding deck (an additional Health each time you summon a minion). The problem is its stats are very lopsided. 1 Attack doesn't help much against the majority of aggressive minions you'll run across, 6 Health dies surprisingly easily if you play it on curve, and without any Attack buffs it's hopeless against the beefy minions slower decks tend to run. Fortunately, druid decks that flood the board to tend to have buff spells. You'd want to play this a few turns in instead of on curve, so you can combine it with a couple of cheap minions and a buff spell. This might be a niche card for a board-flooding druid deck in a particularly aggressive meta, so I suppose it can earn a Poor rating, but that's about it. 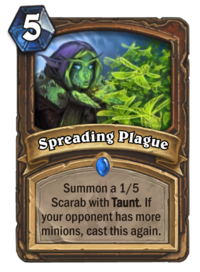 Spreading Plague is the first spell from the new set to be reviewed. It has a neat effect: as long as some condition is met, it casts itself multiple times. However, it suffers from several flaws. First, its Mana cost is really high. If you're playing this on curve, your opponent might well have the means to clear off all the minions it generates. (This may be a plus if you get your opponent to use a Savage Roar or a Bloodlust.) Second, the minions it generates are weak. Sure, they have staying power, but they can't really trade up. Third, in order to get value for Mana cost, you probably need to generate at least three scarabs, and this might not actually help you, because that implies your opponent has a big board, and druid infamously struggles when its opponent has a big board. On the plus side, if you have a buff spell (or two) in hand that you can play at the same time as this card, you can make ameliorate the scarabs' statline deficiencies, and put them out of reach of all but the most potent board clears. There's always the potential to be surprised, but for now, though, I'm still going to rate this card as Poor. The Fatespinner is another card with an interesting effect, assuming, that is, that I am interpreting it correctly. Like many druid cards, it has a Choose One effect, which determines its Deathrattle effect. 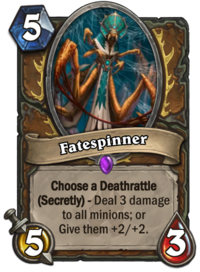 I'm expecting that the "(Secretly)" part of this means that, like a Secret, your opponent does not know which deathrattle you have chosen until the Fatespinner dies. The Fatespinner is interesting because you can mold its effect to suit the circumstances. If you are playing against an opponent who floods the board, you can run it with the damaging effect, and if you are the one with board advantage, you can run it with the buffing effect to empower your other minions. I'm not keen on its 3 Health, though. That said, I think this is a strong enough effect for the card to merit a Fair rating. I don't think the deathrattle effect is inherent to the card, because it is generated by a Choose One effect, so I'm not sure it works well with N'Zoth, but I suppose we'll see what happens in play. The druid class legendary, appropriately a giant spider, is Hadronox, which was a dungeon mini-boss in Northrend. Hadronox has an incredibly powerful effect, respawning your Taunt minions that have died previously in the game upon its own death. It does have the flaw of being an incredibly slow card: with 3 Attack it doesn't have much board impact, at 9 Mana cost you can't play it until very late (and you won't likely play it on curve, anyway), and its effect is a Deathrattle. Of course, slower druid decks have ramp effects to push up the mana curve, so its cost might not be as big of an issue. 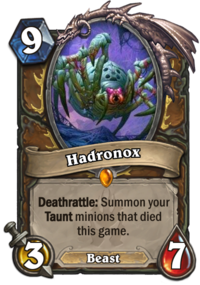 As a Deathrattle card, Hadronax of course has synergy with N'Zoth, especially if you double it up with Taunt minions that themselves have Deathrattle. Hadronax probably rates a Fair rating in Standard and, given cards such as Deathlord and Sludge Belcher, a Good rating in Wild. Next up, we have hunter, which includes not just several cards, but the featured new mechanic of this expansion, the hunter death knight hero! I... think it's a spider...? Mad, they said! Mad, I tell you! The Bearshark is, in addition to relatively obscure Internet culture homage, a relatively decent minion. You get a solid body for the stats, capable of trading with many 4- and 5-Mana minions, and you get some durability that 4/3 cards often lack, in terms of evading single-target removal and damage spells. It plays on curve well with Houndmaster as a follow-up. It still dies to minion effects that deal damage, board clears, and random-targeting spells. I like this card, and I think it's actually pretty good. Its only problem is that hunter often has plenty of 3-Mana choices that are just plain better, such as Animal Companion, Kill Command, Unleash the Hounds, and Eaglehorn Bow. 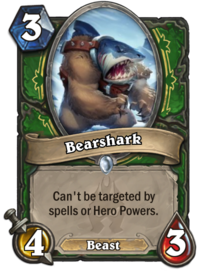 That being said, only one of these generates a minion comparable to the Bearshark, so if you're looking for a 3-Mana minion as a Beast hunter, this has the aggressive stats you're looking for. I give it a Good rating. 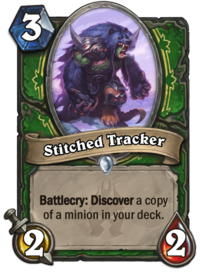 The Stitched Tracker is a card that supports a slower, control-style playstyle for hunter, because it generates a card. The body isn't great for what you pay, but depending on the kinds of minions you have in your deck, it can generate a lot of value down the road. It's a very slow card, though, so it won't fit in aggressive or even midrange hunter decks. The card itself is probably Fair. If control hunter were a more viable playstyle over all, it might have a better rating. The Venomstrike Trap is the trap for discerning hunters who want a little venom with their serpent. As long as you're willing to have it appear on the board at your opponent's discretion rather than yours, it's a straight-up improvement over the 3-Mana Emperor Cobra (although that might not be saying much, since the Emperor Cobra hardly sees play). 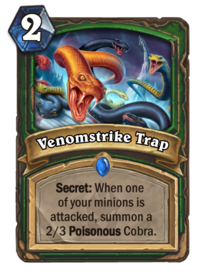 If your opponent has the means to test your Secrets competently, it probably won't be very good, especially not against the kind of decks the cobra itself is strongest against. I'm not sure I'd make room for this in a hunter deck, but it would be solid as a generated card you get from another effect. Since I just wrote that it probably doesn't merit inclusion in a deck normally, I don't think I can give it any better than a Poor rating. Next up, the Corpse Widow. It has okay, if defensive stats, for its Mana cost. Its effect, however, isn't that great. First of all, it's not a minion you really want to play on curve, because then you can't be sure you'll get value out of its ability. Second, the discount it offers isn't so great that you can reasonably expect to play a strong Deathrattle minion. Third, most minions with Deathrattle that hunters play are cheap ones, finding a home in decks that probably wouldn't want to play this minion anyway. 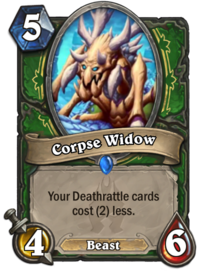 This isn't as big an issue in Wild format, when you could lay down cheaper Piloted Shredders or Sylvanas Windrunners on the same turn you play Corpse Widow. Unless this expansion makes a slow, control-style hunter viable, I don't think this can rate better than Poor in Standard and Fair in Wild. The Abominable Bowman has a clever name, if nothing else. It has the same stats as Boulderfist Ogre, so the extra Mana you're paying is for its Deathrattle effect. 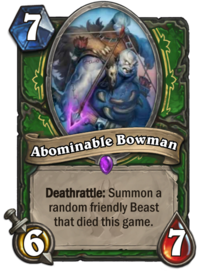 The problem is, most of a hunter's best early-game minions are Beasts, but you'd feel really sad if most of them spawn from the Bowman. Add on to this the fact that a lot of tokens hunter gets from valuable spells, such as Unleash the Hounds, would also be eligible to be respawned by this minion, and you have a recipe for being very upset. 7 Mana is also, ultimately, really slow, especially for hunter. I'm giving this a Poor rating, given the potential it has if anyone finds a way to build a solid hunter deck without the cheap early game minions the class usually relies on. The hunter class legendary is Professor Putricide, who was the final boss of one of the wings of Icecrown Citadel. He's famous for being an homage to Professor Farnsworth of Futurama. Putricide has the ingredients to be a really solid card for hunter. He isn't huge and slow, he has solid aggressive stats for his Mana cost - you wouldn't feel terrible playing him on curve even if you had no Secrets in hand - and his effect has the potential to swing games in your favour. In particular, he can combine really well with Cloaked Huntress, Eaglehorn Bow, and even Avian Watcher, if you can generate a slower hunter deck relying on Secrets. 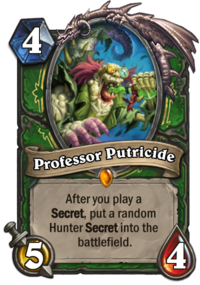 Where most hunter decks run specific, possibly predictable Secrets, Putricide throws a monkey wrench into your opponent's attempts to test out your Secrets. You do have to take care, because you can have a maximum of five Secrets in play, meaning you can play up to two Secrets with Putricide on the board. I'm not quite convinced that Putricide merits an Excellent rating, but I think he's good enough to get a Good one. Here we go, the first death knight card of the set that we're going to look at: Deathstalker Rexxar. Uhh... yeah, sure. Just like it. 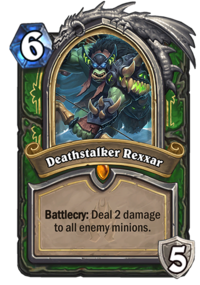 Deathstalker Rexxar has four effects when you play him: he damages the opposing board as per his Battlecry, he replaces the standard Rexxar portrait (along with Alleria Windrunner) with the death knight version, he replaces the hunter Hero Power with "Build-A-Beast", and he grants you 5 Armour. 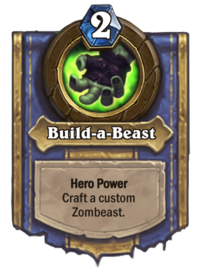 "Build-A-Beast" stitches two Beast cards together into a "Zombeast". The Hearthpedia article on Deathstalker Rexxar describes how it works in detail, so I'm not going to here. 2 damage to all enemy minions and 5 Armour isn't terrible for 6 Mana, although it's not amazing. So, the real question is what value you'll get for Build-A-Beast. Here, I think, the answer is, not as much as you'd like. First of all, keep in mind that you're spending 2 Mana just to build the zombeast, meaning that its actual cost is the combined costs of the two beasts used to build it, plus 2 extra - a clear loss in value. Second, although you choose Beasts using a mechanic identical to the Discover mechanic, meaning you have some control over the effect, you can't guarantee that what you get will be any good. Third, you don't get access to other classes' Beasts, which is too bad (although not entirely unexpected). Fourth, and related to the first point, you're playing the zombeasts from your hand, meaning this Hero Power is very slow - the opposite, in effect, of the regular hunter Hero Power. The upside is that you can't run out of minions to play, which could make a big difference in longer games. Ultimately, this card tries to shoehorn hunter into a slow, control archetype. How it fares will depend on whether it, alongside the other cards introduced this expansion and all the other cards in play, manages to succeed. I'm not sure it will, especially since we're not seeing the reliable card draw and big board clears that most control decks need, but I can't say for sure that it won't. I'm rating this card Poor. Lastly, we have the shaman, including its class legendary and new death knight card. I bet it's a hit at parties. until it reaches the future. Or maybe a train troll? 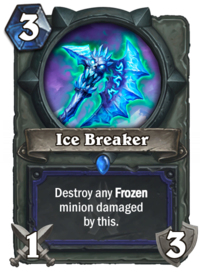 The Ice Breaker is a weapon designed to clear off minions without having to ping them - as long as you can Freeze them, first. At 3 Mana, it's a bit expensive to use for early-game clears. (You're probably better off using the Spirit Claws or Jade Claws for that purpose.) The downside is that the kind of minions you want to kill when they're Frozen probably aren't the kind of minions you want to hit with a weapon, meaning you probably need to pair this card with Taunt minions and heals. Incidentally, this shows a big shift in shaman, insofar as it's adopting a mechanic that was only available in a limited fashion to most classes, and was mostly the preserve of mages - the Freeze mechanic. 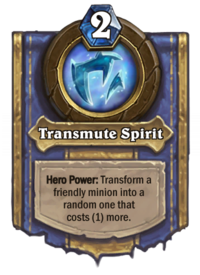 That being said, with the shaman's options for Freezing enemies being Frost Shock, Glacial Shard, and the other cards it gets so far this expansion (no, Frost Elemental doesn't count), it doesn't feel like there's much support for this weapon, or the style of play it entails. As such, I can't rate it any better than Poor. Next up is the Voodoo Hexxer, a card that, in some small part, answers the call for ways to Freeze opponents. 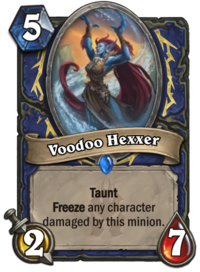 If Water Elemental is the standard Freeze minion, at 3/6 for 4 Mana, then what are we getting from Voodoo Hexxer for 1 extra Mana? The stats aren't any better - it's the same point distribution, shifted slightly, so all we're getting is Taunt. The shift in life is good, since it survives a lot of effects that deal 5-6 damage, but if the meta stays aggressive, I just don't see how it's going to work out. I give this a Poor rating. 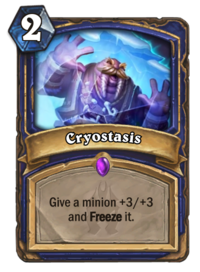 Then we have Cryostasis, which gives any minion a big buff and then Freezes it. +3/+3 is always nice to have, but the Freeze is a real killer. I guess you could use this on a Taunt minion if you don't care whether it attacks or not? Ragnaros in Wild format? I don't know. If you had a better way to destroy Frozen minions (and maybe you'll get one in the yet-to-be-released cards), it could be useful to use on enemies. As it is, for now, it doesn't rate better than Terrible. 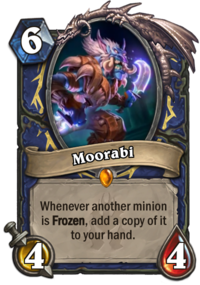 Last but not least for regular cards, the shaman legendary minion, Moorabi. Moorabi is an ice troll, of the Drakkari trolls of Northrend. He was the High Prophet of one of the Drakkari loa (something close to gods or great spirits), though in the face of the resurgent Scourge threat, he and his fellows began to destroy their own loa patrons to get the power to turn back the Scourge. The heroes of World of Warcraft face him down in the temple of Gun'Drak. He is therefore a fitting legendary minion for shaman. As for the card itself, I can't say I'm that impressed. 4/4 for 6 Mana is a pretty mediocre statline. Because his Health is so low, you probably need to have either some Frozen minions (your own or opposing) already on the board when you play him, or play him in later turns and throw down some Freeze effects. His ability is pretty cool, but there's always the danger of it being finicky. You'd hate to not have a good time to play him in a game, especially since you have to build your deck around his effects. As things stand, I can't see him rating better than Poor just at the moment. The last card we'll look at today is the shaman death knight, Thrall, Deathseer. At 5 Mana, Deathseer Thrall isn't too expensive, although he doesn't quite provide great value. By way of comparison, two castings of Evolve costs 2 Mana, so you're spending 3 extra Mana for the Armour. The death knight Hero Power is like a lesser Master of Evolution, that doesn't leave a 4/5 body on the board but only costs 2 Mana as compensation. I rather like the Deathseer, because he can fit into multiple archetypes: he can work with a board-flood shaman, where he boosts a pile of tokens and totems (possibly following up with Bloodlust or a Flametongue Totem to secure the board or end the game), and with midrange and control shaman variants to bring their midgame minions over the top. That being said, the changed Hero Power isn't as effective in board-flood style shaman decks, where spawning totems that you can use (with cards noted previously), or in other aggressive decks, which don't usually need Evolve effects. 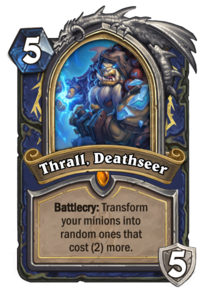 I'm not entirely convinced that Thrall, Deathseer, is close to an auto-include in shaman decks, so for now I'm going to rate him as a Good card. That's it for now. Definitely more promising pile of cards than last time. A lot of the hunter cards might be underrated if someone manages to develop a viable control hunter deck, and the shaman cards might be underrated, so long as the class gets more support for Freeze this expansion. Here's a running tally of cards and their ratings. For cards with different ratings for different formats, I'll use the Standard rating.